When you study graphic design at St. Cloud State, you'll develop your skills in communicating visually through typography and images. You'll learn to find solutions for design and communication problems. Technology will become a part of your environment as you explore print, web and interactive design practices. 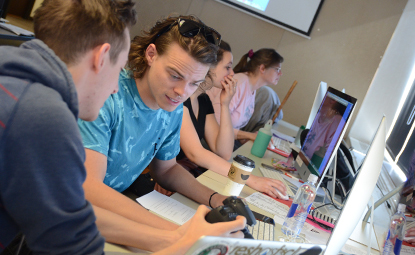 You'll study contemporary methods and issues in graphic design, design history and theory while you develop your creativity in conceptualizing, problem-solving and implementing communication solutions. A required internship will give you experience translating your creativity into addressing the day-to-day demands of a designer. Visiting Artists, Designers, and Curators Program, annually invites three or four national arts professionals such as Nicholas Brown, a curator from Yale; Michelle Grabner, Chicago artist and co-curator of the 2014 Whitney Biennial; and Mark Randall, New York graphic designer to lead workshops and meet with students one-on-one to discuss their work.